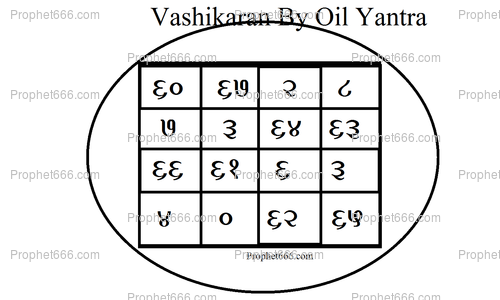 This Vashikaran Yantra, which has been described by me in this post, uses a special yet simple method with Oil to cast a Voodoo Vashkaran Spell on any man or woman to control that person and mange him or her for any purpose. The purpose, in the context of this Vashikaran Spell should be noble and not meant to physically, mentally or financially harm the person who has been put under a Vashikaran Spell; otherwise, such Voodoo Spells are believed to revert upon the Spell caster. The Spell as mentioned above is simple; all that the practitioner has to do is to draw the Yantra in the image on the bottom side of a Metal Utensil using any kind of ink or pen. Then he has to fill Oil [any kind of edible Oil will do for this Spell] and keep the Utensil in such a place where the desired man or woman will see the Oil filled Utensil. When the desired person sees the Utensil, the Vashikaran Tantra says he or she will come under the influence of the Vashikaran Spell. Guruji, kripya mangal beesa yantra banane ki vidhi batayein. Sir, what should we do with the oil later? The Oil can be immersed in water, like all other Puja or Tantric items, which are not needed. is the yantra should be visible over the oil, or we need to write the yantra bottom of the utensil where it is not visible. 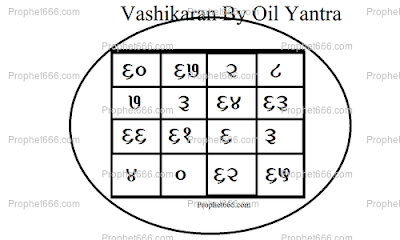 The Yantra as explained in the post has to be on the bottom on the vessel and oil poured over it.